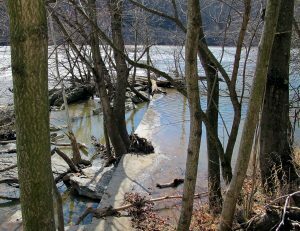 In 1799, a dam was created here to serve the armory at Harpers Ferry. Its use of natural rock supports created a unique zig-zag structure across the river. Unfortunately, the dam proved largely ineffective in supplying water to both the armory and the skirting canal during the dry season. It was rebuilt in 1820, and then in 1832 the infrastructure of dam was used by the C&O Canal to build its Dam No. 3, which watered the Canal down to Seneca. In addition to the jagged remains, you’ll also notice a concrete facing on the upstream side of the river, which is a later addition.